Poland has never been more prosperous, stable and safer than at the start of the 21st century as a sovereign state as well as a member of NATO and of the European Union. It is at peace with its neighbours and enjoys enviable rates of economic growth, investment and employment. Yet the country is haunted by feelings of national insecurity and historical grievance. Chairman of the ruling party Law and Justice, Jarosław Kaczyński sees enemies and threats everywhere and safety, if at all, only in the tightest possible bilateral defence relationship with the United States rather than in the collective embrace of European partners and NATO allies. In this context, Friends of Europe is releasing a study on Poland and the future of European defence. Authored by Paul Taylor, Senior Fellow at Friends of Europe and POLITICO columnist, it examines Poland’s strategic position, its defence relationships and diplomatic alliances, the role and current state of the armed forces, and the place of its defence industries. It will offer recommendations for how to optimise Poland’s defence policy to best assure its own long-term security interests and those of Europe. The study is a part of Friends of Europe’s series on European defence cooperation. It complements three similar studies on France, Germany and the United Kingdom’s roles in European defence. 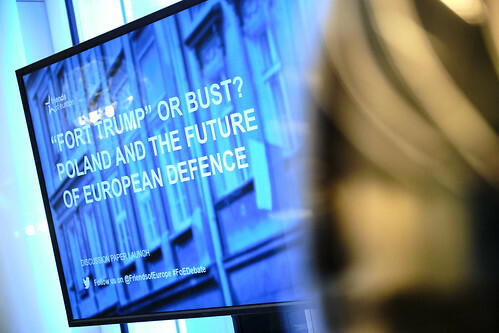 Friends of Europe’s series of studies on European defence cooperation focus on views from the capitals and bring together influential voices that contribute to the series through interviews. Poland has never been more prosperous, stable and safer than at the start of the 21st century as a sovereign, independent state and a member of NATO and of the European Union. It is at peace with its neighbours and enjoys enviable rates of economic growth, investment and employment. Yet the country is led by a reclusive politician haunted by feelings of national insecurity and historical grievance. Jaroslaw Kaczynski sees enemies and threats everywhere and safety, if at all, only in the tightest possible bilateral defence relationship with the United States rather than in the collective embrace of European partners and NATO allies. Anna Maria Anders is both a Senator and a Minister in the Republic of Poland. She is Secretary of State in the government of Poland’s Prime Minister, Mateusz Morawiecki, where she is the Plenipotentiary for International Dialogue. As a senator, she represents Poland’s eastern flank which includes: Lomża, Augustów and Suwałki. In addition she represents Poland in the WIP (Women in Parliaments) Global Forum, a global network of female parliamentarians that supports greater participation of women in politics and promotes equal rights of women worldwide. Tomasz Szatkowski serves as a Deputy Minister - Under-Secretary of State in the Ministry of National Defence. He has a long experience in national security, especially in defense policy and armaments as well as the supervision of special services and public media. In recent years, he has been assigned by the Minister of National Defense Antoni Macierewicz to prepare the Polish position for the NATO Warsaw Summit. He has also led the Strategic Defense Review which has been finished in May 2017. This event is exclusive for Friends of Europe members or by invitation only. Our events include photos, audio and video recording that we might use for promotional purposes. By registering, you give your permission to use your image. Should you have any questions, please contact us.